TORONTO, Feb. 5, 2018 /CNW/ - First Cobalt Corp. (TSX-V: FCC, ASX: FCC, OTCQB: FTSSF) (the "Company") is pleased to announce positive drill results from its 2017 drill program, intersecting over 30 metres of disseminated cobalt mineralization in the southern part of the Canadian Cobalt Camp. Multiple drill intercepts in this area demonstrate that cobalt mineralization likely occurs as a broad zone, over approximately 350 metres of strike length associated with the historically mined Woods Vein and other transecting structures. 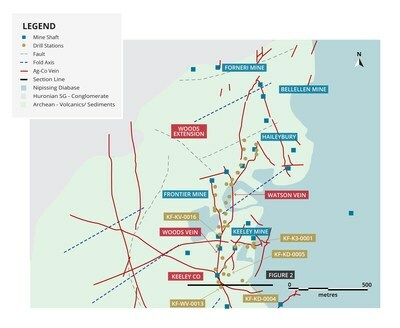 "A key objective of our maiden drill program has been realized. 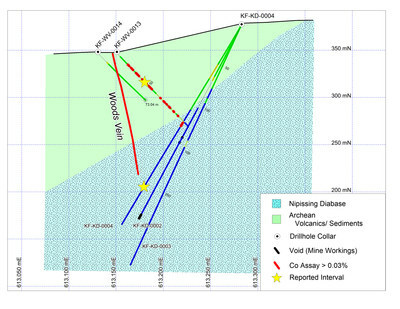 We have demonstrated that disseminated cobalt and silver mineralization exist near-surface and outside the veins that were the focus of historic underground mining operations, confirming findings from our 2017 surface sampling and prospecting. Drilling is now underway at the Bellellen mine in Cobalt South and shortly thereafter we will drill targets in Cobalt North."